Imagine being with your special someone, under the stars, with a cup of steaming coffee and the forestry breeze the night brings. Sounds romantic, right? Take a break from your work and consider going camping this weekend! It’ll add a little spice to your relationship and can even boost your mental health in the process. However, there would be no perfect camp without the best camping mattress for couples! No one wants to feel the sharp edges of rocks while sleeping. And when it comes to choosing the best couple camping mattress in the market, there are three things that you need to consider: (1) durability, (2) portability, and (3) thickness of the mattress. Allow us to be your guide in choosing the best couple camping mattress for you with the top 8 best couple camping mattresses in the market. This camping mattress from Intex will take your camping experience to a whole new level. The airbed is constructed using Fiber-Tech construction, allowing you to enjoy optimal comfort while you cuddle with your loved one. 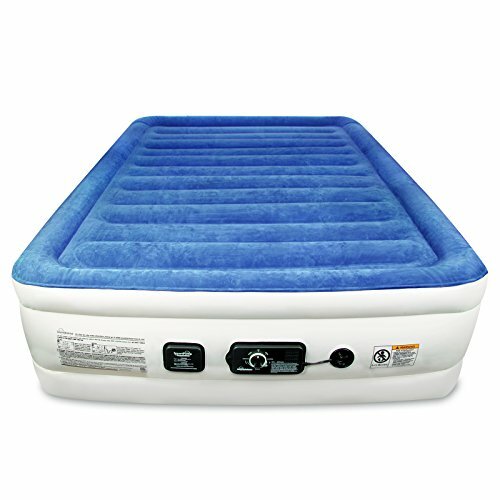 It has an integrated pump that will enable you to deflate and inflate the airbed within seconds. Putting a fitted sheet is no hassle with the Intex air mattress thanks to its indented sides and waterproof flocked top raised 22 inches above the ground. No need to worry about the rain, as you will stay warm and comfortable lying on the bed. The package includes a duffel bag for easy transportation and improved portability. Campers love Coleman products so allow us to present a couple of camping mattress from this company. The Coleman premium double high support rest airbed has a soft suede top for maximum comfort when sleeping. Now camping feels as if you’ve never left home! Also, compared to other products, this airbed has an extra height to provide optimal comfort to your back. It has a built-in electric pump with double lock valve and airtight system. Deflating and inflating the product is a breeze. Albeit it takes too much space when collapsed, the package comes with a zippered bag for easy storage after every use. And the best part of this product is it features the ComfortStrong coil construction that will follow the natural contours of your body when you lay down. Now, there would be no more backaches and sore muscles after waking up in the forest! As a camper, you’d like to own the most durable air mattress as possible. 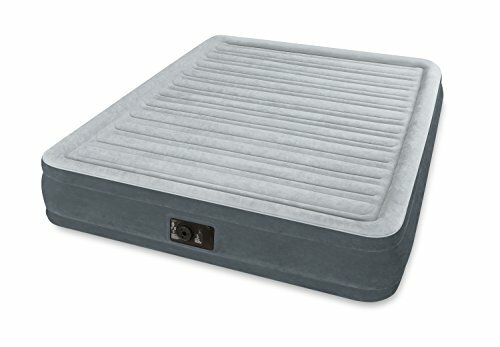 So, allow us to introduce the queen air mattress from Cloud Nine Series of SoundAsleep. 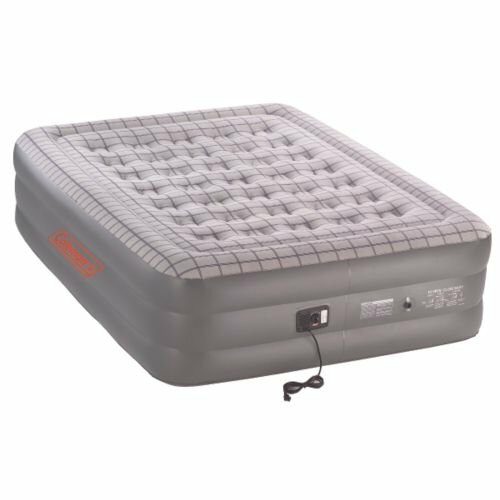 This airbed features a dual smart pump technology that will continuously run even though you’re using the product. It’s an advantage if you compare it to the pump systems of other brands. Also, thanks to its superior durability, you can use this airbed for both indoor and outdoor activities. It has three comfort levels that will suit any sleepers. In approximately four minutes, you can inflate and deflate the airbed. The Smart Pump monitor will maintain the air pressure inside. No one wants to wake up with a backache because the airbed deflated in the middle of the night. For safety purposes, it also has an auto-shut that will automatically turn off the pump system when you reach the maximum firmness level. If you are in a tight budget, you might want to take a look at the KingCamp double outdoor camping airbed. So far, it is the ideal airbed we’ve found in the market because of its small size and lightweight. Albeit it does not feel like your mattress in your house, rest assured that it’s portable and easy to carry. 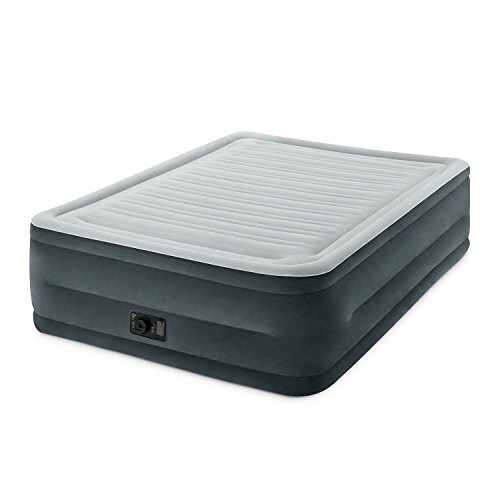 The airbed is made of 190T polyester. Its entire cover is waterproof and can resist scratching. It’s generally easy to use and environment-friendly. It features an integrated foot pump, allowing you to deflate and inflate the airbed within two minutes, much shorter compared to the previous product. With proper use and maintenance, rest assured that it can last for many camping years to come. Best of all, you need not burn a hole in your pocket thanks to its budget-friendly price. If you wanted to feel comfortable while sleeping inside a tent, you should check out the inflatable queen airbed from Intex. This airbed is a part of the Dura-Beam series of airbeds, featuring the Fiber-Tech construction. It has an integrated pump for fast and hassle-free inflation and deflation. In just four minutes, you can set it up and sleep comfortably. Similar to the previous products from this manufacturer, it also has a waterproof flocked top with indented sides, allowing you to put a fitted sheet to your mattress. It is raised 18 inches from the ground for your optimal comfort. The package includes a duffel bag, allowing you to store and transport the product easily. Who said you couldn’t have a luxury bed camping? Introducing the Insta-Bed raised air mattress with the never flat pump. This airbed will make your camping trip much better by improving the quality of your sleep. The never-flat pump offers more air to maintain the firmness of your airbed while you are sleeping. However, because you need an hour inflating the bed before you can use it, it may not be ideal for go-to camping and backpacking. You can use this airbed for weekend getaways, but when it comes to the speed of inflation and deflation, it might take some time. Despite this factor, rest assured that you’ll never have a better sleep in the forest with this luxury and comfortable camping mattress. We also have the ALPS mountaineering velocity airbed. It is one of the best-selling products from the manufacturer. 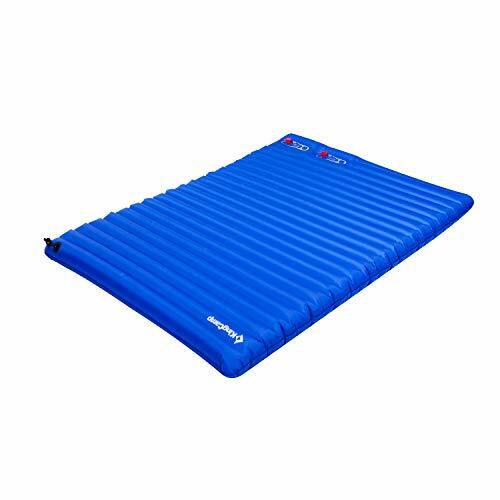 This airbed is perfect for any campers thanks to its portability, easiness of use, and great price. The pump is easy to use. You can inflate and deflate the airbed in just a few minutes. Included in the package is a carry bag that allows you to bring the product wherever you want. It features an integrated coil system that will distribute your weight throughout the mattress evenly, providing optimal comfort in the long run. You can choose between two sizes: (1) twin and (2) queen. Its army green color also appeals to mountaineers and backpackers who are always on the run. For our last product, we have a queen-sized comfort plush mid-rise dura-beam airbed from Intex. This inflatable queen bed features a Fiber-Tech construction for superior durability. 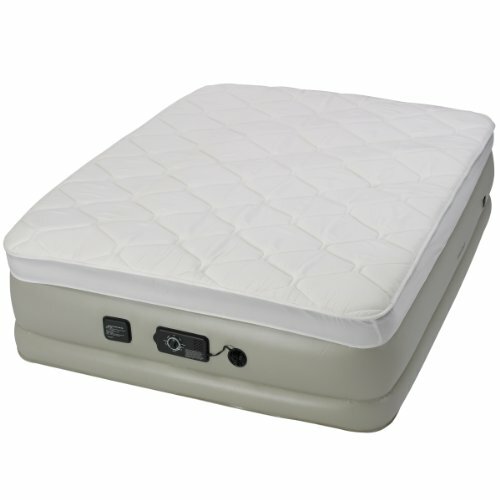 It also has an integrated electric pump for a quick and hassle-free deflation and inflation of the air bed. In less than four minutes, you can set it up and use it to your desire. Furthermore, the waterproof flocked top with dura-beam technology makes this product worthy of an investment. The airbed is raised 13 inches from the ground. The indented sides will keep the fitted sheet in place. It also comes with a carry bag for improved portability.